Los Angeles Travel Show— Today Sunday 2/28/16 in Long Beach! Living Like a Local In Italy—Means Cooking With The Chefs! 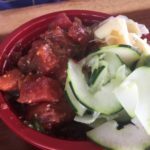 Culinary Classes On The High Seas? It Doesn’t Get Any Better Than This! 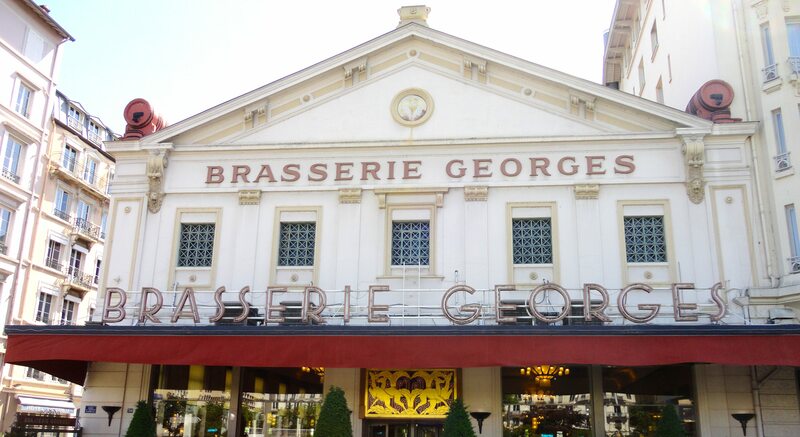 Revisiting Our Favorite Restaurant In Paris! Exploring Paris In Three Days Flat! 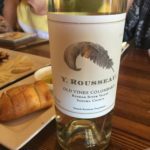 Discovering Two Unique Wine Bars in La Jolla… You Just Gotta Try Them! Along Prospect Street in the heart of downtown La Jolla Village, we passed by one adorable shop and boutique after another. 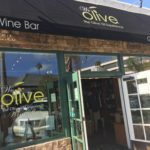 We Olive & Wine Bar was really our destination, but a little shopping along the way was fun too. Little did we know, as we stepped inside, it is SO much more. 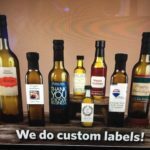 They are famous for their balsamic vinegars and olive oils—many of which proudly grace my kitchen counter and are used quite often. 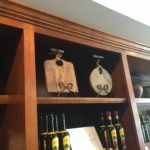 However in this location, they also carry a wide range of other food products, tapenades, trays and serving dishes, craft beer, a lovely wine bar and a culinary program to complement the wines. There is even a deck out back perched above the trees with peek-a-boo views of the ocean below. There really has a neighborhood feeling to the retail shop. 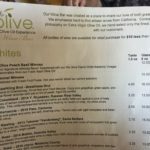 We Olive offers complimentary tastings of all of their California Extra Virgin Olive Oils, vinegars, and gourmet foods. 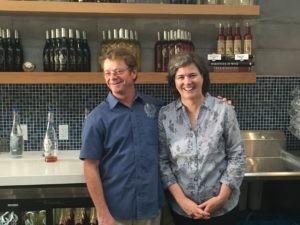 They also draw their local crowd in as they have a special event monthly called “Meet The Wine Maker” where guests can meet a wine maker right there in the shop. 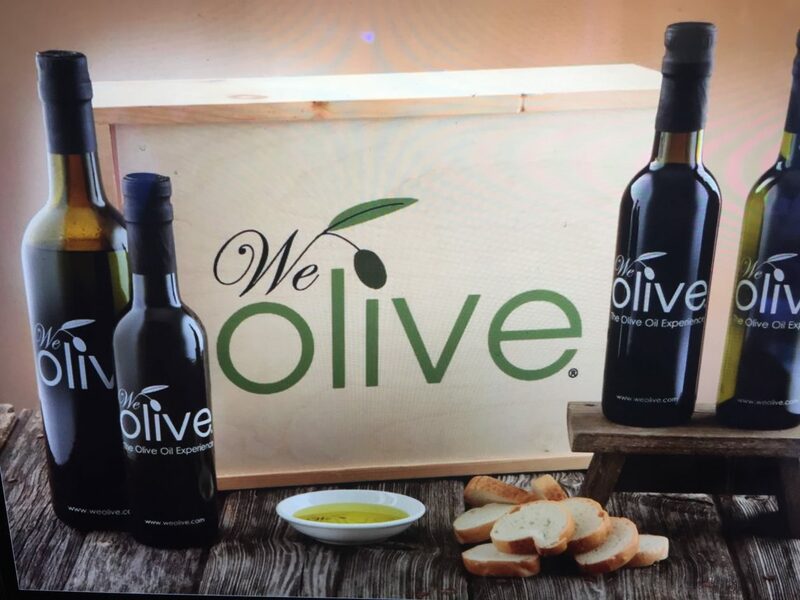 Their “Sample Saturday’s” held between 11am until 5pm (or while supplies last) allow guests to sample some culinary creations featuring We Olive products. 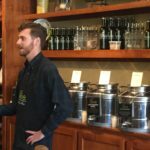 Guests taste, get recipes and learn new ways to use their favorite olive oils, vinegars, and gourmet foods. Their web site has a great monthly schedule with menus and lots of details. They also do private parties which would be so fun in this setting, and will do up gift baskets upon request. I often give olive oil as a housewarming gift to friends that I know will use it and appreciate the fine quality. And there are so many things that can be done with them! As he was talking my head was spinning with ideas of new things to make! I often drizzle the Blood Orange Olive Oil on salad and add a sprinkle a bit of the Blackberry Vinegar. That is the perfect complement for a summer salad with Mandarin oranges, cucumber and fresh red-leafed lettuce. My salad bomb! One of the servers here is very into beers, so he has brought his sensibility of beer tasting to the table here in ordering for the wine bar. He has elevated the beer program at this location. Not everyone likes wine, am I right? He draws from local brew houses (like McKeller in Mesa), Barley Forge (from Costa Mesa), Modern Times (Anaheim) and some from Portland and other parts. Nice addition to a wine bar indeed. 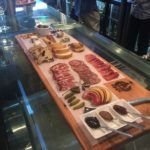 We began with a lovely Charcuterie board with all kinds of cheese and colorful accents such as wild honey. The board includes five items, and on this fine day we had displayed before us: Brillat Savarin (a triple cream cow’s milk from France), Ptit Basque (also from France and this was a sheep’s milk with a nutty subtle flavor), Zamorano (from Spain a sheep’s milk aged for six months), Tartufo (a US pork Salami with black summer truffle), and Salametto (a US pork salami with garlic and red wine). The boards are regularly $20 however during Happy Hour they are $17. 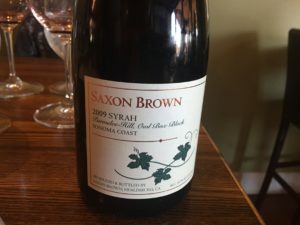 This was paired with a white wine varietal that had hints of floral and lemon flavors. It was very refreshing and the perfect wine to start our tasting with. Price was $3.25 for taste, $13 for a glass and $38 for the bottle. 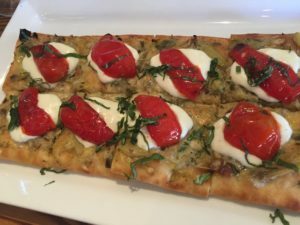 We enjoyed three different flatbreads and I loved them all. One was topped with a artichoke caper tapenade (which can be purchased at the shop). The second one was a Margarita-style with Mozzarella cheese, tomatoes and fresh basil. The third was made with cheese and their Meyer Lemon olive oil drizzled atop. 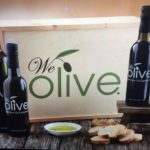 I would like to extend a heartfelt thank you to We Olive for their kind hospitality to our group. 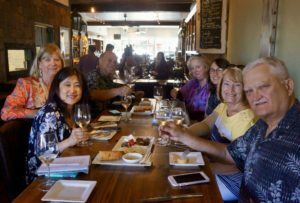 We had such a great time and now know where to pop in when we are visiting La Jolla. A Fun Recipe To Try- Prosciutto-Wrapped Dates The staff has a cadre of recipe cards that can inspire guests as to what to do with these bottles of goodness. Here is one of my favorites that they shared with me and I ran home to make this. The recipe makes 24 bites. This tasty appetizer pairs beautifully with wine. Dates are stuffed with goat cheese, drizzled with Blood Orange Balsamic Vinegar and Meyer Lemon Olive Oil, then topped with walnuts. Directions: Preheat oven to 350 degrees. Sliced the dates in half lengthwise, remove and discard the pit. Tear or slice each prosciutto slice into 2 or 3 long pieces. You should have 24 pieces total. In a medium bowl, combine the goat cheese with the Meyer Lemon Olive and mix until thoroughly combined. Place the date halves cut side up and using a small spoon, place a teaspoon of the lemon goat cheese in the center of the date. Place a stuffed date half on the largest end of the Prosciutto slice and roll the Prosciutto tightly around the date. Place on a baking sheet and cook for the 8 minutes until Prosciutto is crisp and dates are heated through. To serve, skewer with toothpicks, drizzle with Blood Orange Balsamic and sprinkle with crushed walnuts. 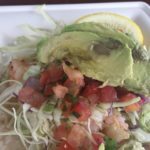 Our second destination had us leaving the busy downtown area and zipping down La Jolla Boulevard. I had forgotten how fast this “local’s thoroughfare” can get me from the busy downtown area to the quiet south end of town in a flash. Through tree lined streets and one charming residential area after another we land in the Bird Rock neighborhood. 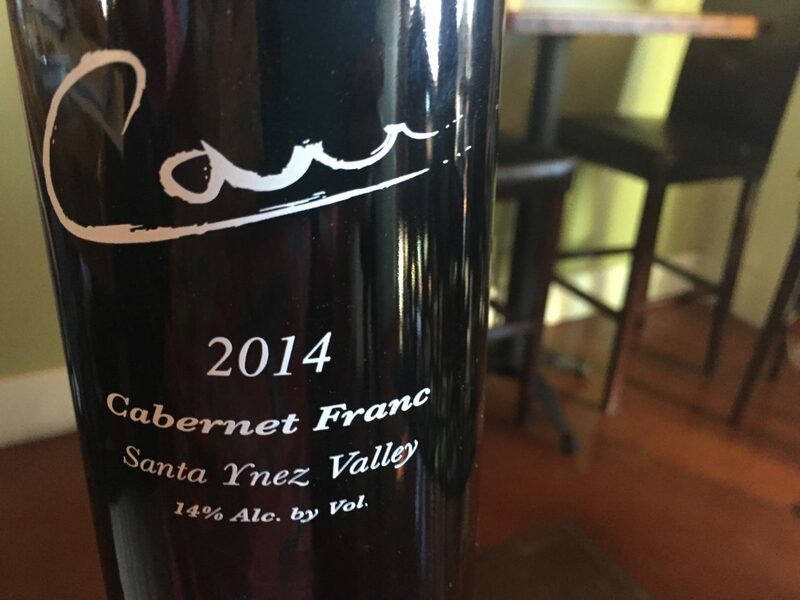 This is home to a “one of a kind” wine bar and you will soon see why. Very creative, and leaves me wondering— “why didn’t I think of that”? 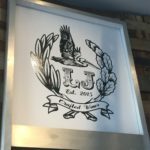 Meet Lowell Jooste, Founder of LJ Crafted Wines. The LJ of course are his initials but they are also the initials of the town he now calls home. He and his family hail from South Africa and are fourth generation wine makers. 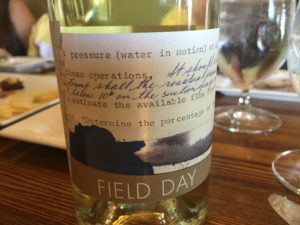 He gravitated to the UC Davis area because of the excellent school and passion for viticulture, but also, as he explained to us— the climate was quite similar to his homeland. But then they headed south to beautiful La Jolla. He and his lovely wife Anne are totally immersed in the business, as you might expect, and later on in our visit their children popped in to say hello as well. 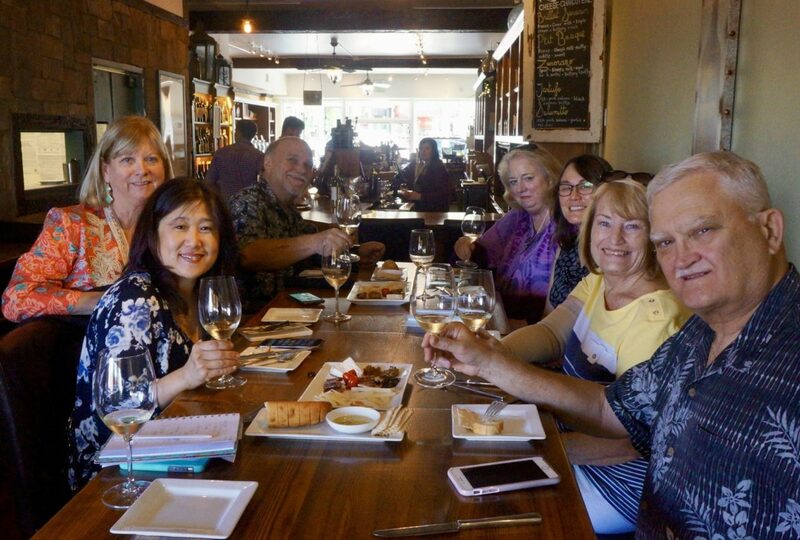 They have assembled a passionate and knowledgeable team of Wine Stewards. Some are Sommeliers and some are in training, but everyone is very passionate about what they are doing. 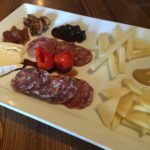 The wine bar sits smack-dab in a residential neighborhood with just one block of beachy restaurants and boutiques. 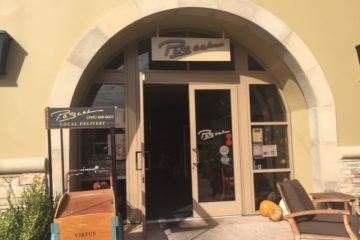 Along the sidewalk there is a one lane patio of tables and chairs right out front hugging the storefront, with large windows that open like a garage doors. This gives the ambiance of the SoCal indoor/outdoor vibe we love. And being a neighborhood spot, folks wave right through the window, or shout a “Hey, what’s up” as they stroll past. Some step in for a five minutes with growlers in hand to be filled, and others sit down to the bar for a glass of wine, a nibble and a visit. There is an “L” shaped bar along the left side, with tables for two along the right. Interesting factoid… the distressed wood textures along the wall are made from their own barrels that were broken in the Napa earthquake a few years back. That is a sad story but they made lemonade out of lemons for sure. Toward the back of the shop is where the magic happens. There is a kitchen and huge barrels are racked and ready to pour. My favorite spot is right up at the bar. What makes this wine bar so unique is that there are no wine bottles in sight. 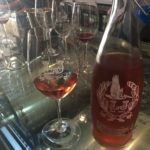 Lowell is turning the dispensing of wine on its ear. Knowing how much money is spent on the marketing and the bottles themselves, he decided to shift the delivery and he goes directly from “barrel to the glass” or for those taking away, from the “barrel to growler”. With ready to drink wines. Simple right? Well not so fast. 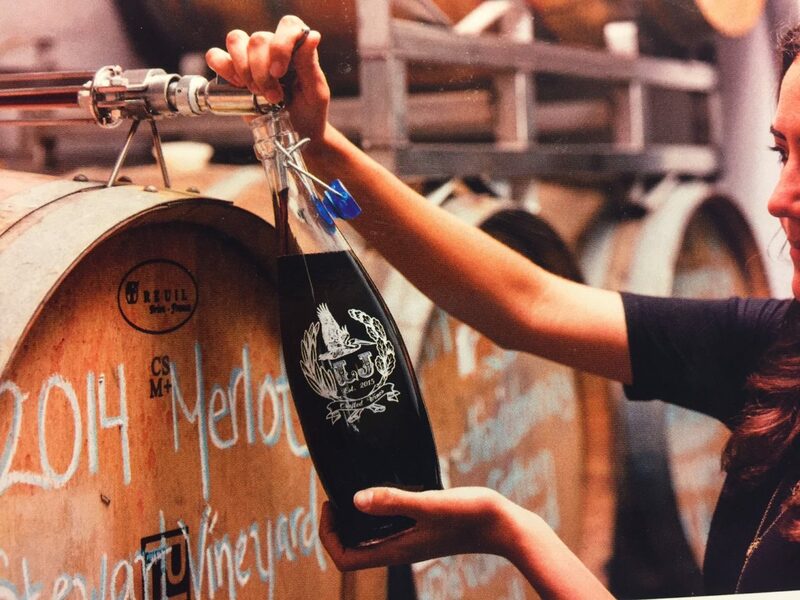 He had to figure out a way to keep the wines aging properly, in a protected environment, and also to be sure the growlers are sanitized for each refill. 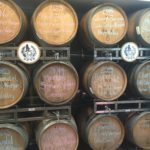 So in terms of the barrels, he has a patent pending process called the Wine Steward which allows the wine to be served directly from the barrel. Similar to a Coravin (a needle you can push through a cork and sample a very good wine without completely opening the bottle). This method adds a very low pressure of nitrogen and carbon dioxide into the barrel. The process allows them to serve directly from the barrel and at the same time maintain the integrity of the wine inside the barrel. In the beer world they have been using growlers for many, many years and now it’s wines turn to capitalize on this “to go” concept. I see them lining up at Ballast Point Brewing on India Street in San Diego on Saturday morning with growlers in one hand and a cup of coffee in the other. Here it’s the same thing. But first Lowell and his team and to figure out three things: a design for the growlers with an air tight closure, a new fan-dangled automated dishwashing system to clean the growlers and a wine club program that gave the members a reason to return on a regular basis. Mission accomplished and not to mention what a wonderful recycling program this is as well. Score! 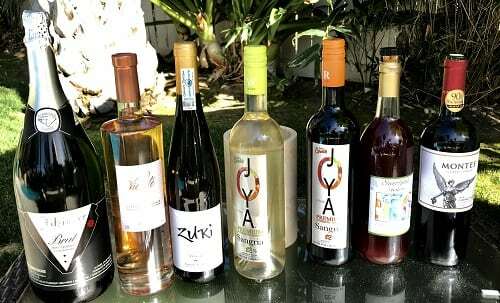 The wines are small batch wines and they arrive regularly throughout the year. There are around 8-10 different wines as I can see from the stacked barrels. 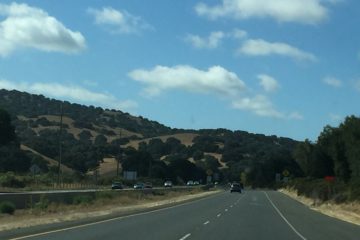 Grapes are sourced from growers in Napa & Sonoma, vinified by the winemaker, Alison Doran Green in Napa and shipped in barrels to LJ Crafted Wines in La Jolla. In addition to Lowell’s many years in the business and his family’s heritage in wine making, I hope you get a chance to meet Level 2 Somm Derek Bacciocco. 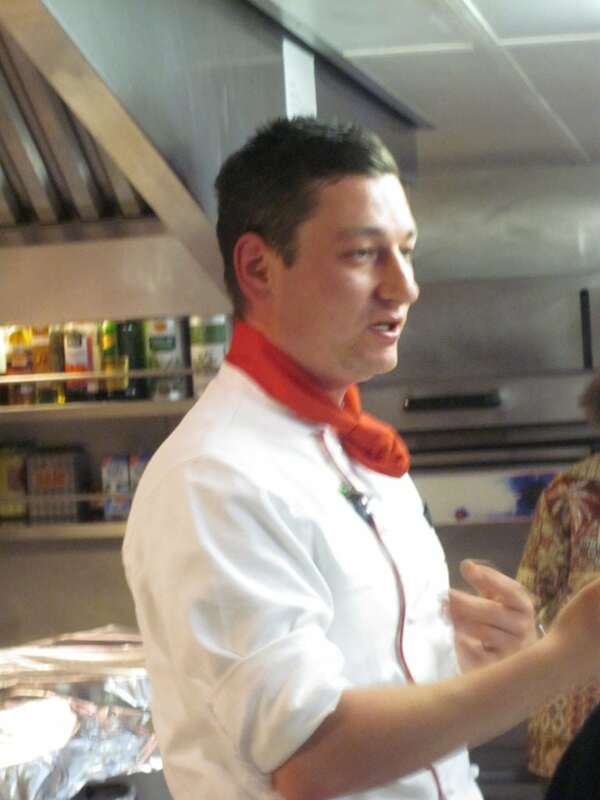 He is found being the bar many nights and you will find his passion for the vino is quite infectious. As we were discussing the various wines we were tasting, Derek whips out this cool 3-D topography map and soil samples to educate and share with us where this is coming from. A pictures worth a thousand words but don’t miss his input while you are there sipping away. The Charcuterie Board was really like none other I have seen, except perhaps in Barcelona, but that’s another story for another day. 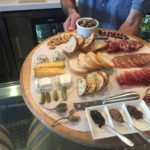 It is bistro-style and in addition to a bevy of cheeses, there was olives, feta cheese, nuts, tapenades, salami and of course my favorite was the Humboldt Fog cheese with a thin thread of blue cheese. There are other delicious appetizers available, but this one is a show-stopper. 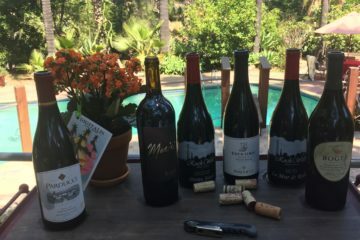 During our splendid visit, the staff had prepared for us a selection of five wines. The printed list always makes my heart sing, as I have a terrible memory. With this in-hand, I can always keep track of what I am enjoying and jotting down notes on my faves along the way. Now when you stroll in, the offerings will likely be somewhat different, but this should give you a good sampling of what you are in store for. So there you have it. 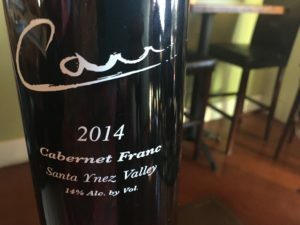 A wonderful neighborhood wine bar that is doing things a bit differently and loving every minute of it. You may or may not be a “local” but do stop in. 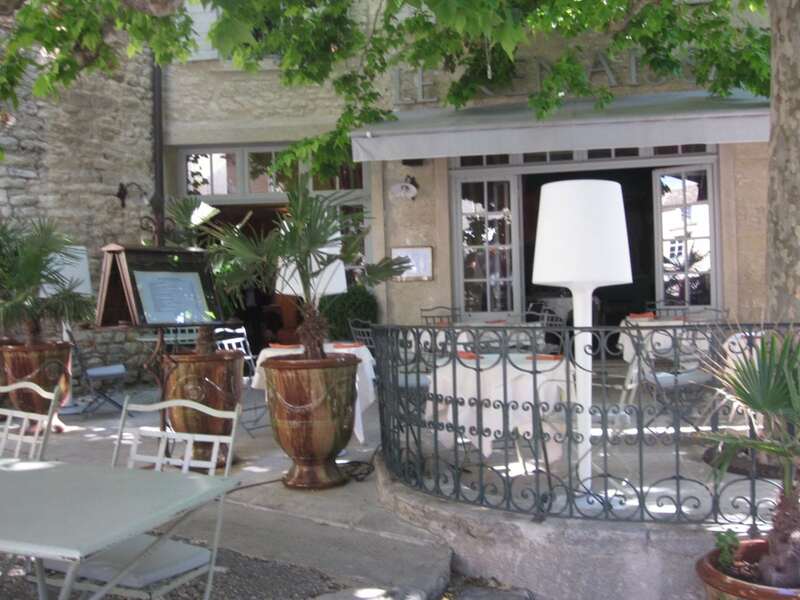 You will certainly feel like you are a local and enjoy some great wines and a warm welcoming staff. A big thank you to Lowell and his entire team for their kind hospitality and delicious adventure at Bird Rock. Thank you to IFWTWA for arranging our visit to these two lovely spots. Dock & Dine In The Beautiful Newport Harbor—Just In Time For Summer Fun!